Donald Trump's Businesses Pose New Conflict Of Interest Questions One issue is what to do with all the businesses he owns. Other newly elected presidents have placed investments in a blind trust, but Trump's business empire is on a completely different scale. 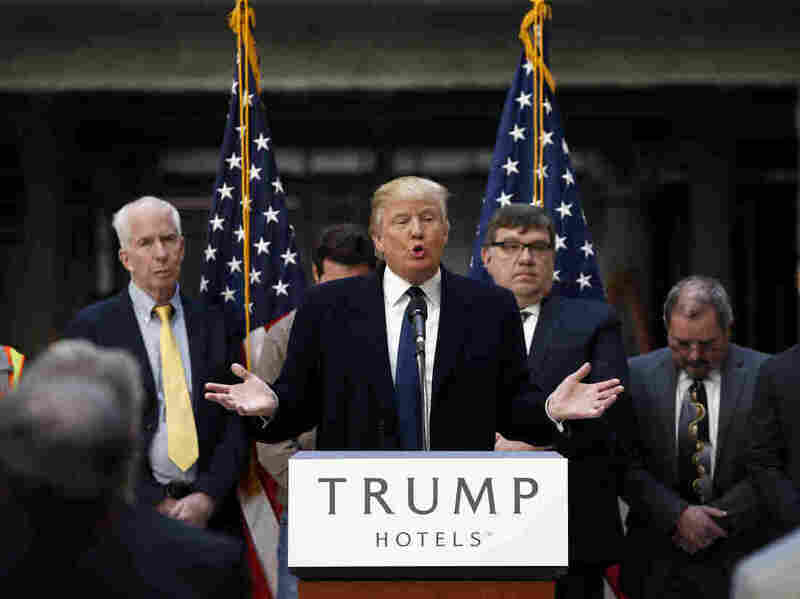 Donald Trump speaks during a campaign event March 21 at the Old Post Office Pavilion, now a Trump International Hotel, in Washington, D.C.
Never before has someone ascended to the presidency owning the kind of complex network of businesses that Donald Trump operates. Trump has promised to turn his company over to his three grown children to run once he's sworn in. But he has refused to do what other presidents have done to insulate himself from conflicts of interest. Trump's new hotel on Pennsylvania Avenue in Washington, not far from the White House, is built in a grand old federal post office building. He had to negotiate with the General Services Administration to build it, and the lease allows him to renegotiate the terms under certain conditions. Trevor Potter, former head of the Federal Election Commission, says that represents a big conflict of interest for the president-elect. "You're going to have a situation where the president appoints the head of GSA, and then the president's most visible asset in Washington is potentially subject to negotiation with that person over the terms of the lease and any changes in the lease," Potter says. Potter says he's surprised there wasn't more attention focused during the campaign on the many potential problems that Trump's businesses might create. The president-elect has borrowed from foreign banks his administration will regulate. He does business in countries that are vital U.S. allies. And he has lots of pending lawsuits working their way through federal court. "The number of problems is actually sort of mind-boggling," Potter says. Though they're not required to, presidents have usually dealt with conflicts like these by putting their assets in a blind trust run by someone independent. Jimmy Carter did that with his peanut business. George W. Bush resigned as managing general partner of the Texas Rangers before becoming president. Trump's situation is much more complex. Rather than divesting himself of his businesses, he says he'll turn them over to three of his grown children to run. "I have Ivanka and Eric and Don sitting there. Run the company, kids. Have a good time. I'm going to do it for America," Trump said at a debate in January. Trump promises he won't interfere with the decisions his kids make, or even talk to them about business. Robert Weissman, president of the liberal advocacy group Public Citizen, finds that hard to swallow. "The idea that there's some independence there is laughable," he says. "There's zero reason to expect they wouldn't talk about those issues, given everything we know about how they relate and how those businesses are run." Weissman says even if Trump never talks to his children about company decisions, he built the company himself, so he's all too aware of what kinds of businesses he operates. That can influence the decisions he makes as president. Would he, for instance, want one of his regulatory agencies to fine a big German bank that he owes money to? Just as important, Potter says, other countries could end up giving the Trump Organization special treatment in an effort to influence him. "If his daughter or his son-in-law turns up in a foreign capital to negotiate a business deal on behalf of the Trump business, that foreign government is going to certainly think they're doing business with the family of the president of the United States, which indeed they will be," Potter says. And because the Trump businesses are privately held, they don't have to release much information to the public about their operations. So there's going to be no real way to tell what Trump's companies are doing and how their goals may intersect or conflict with his administration's policies.